Google Street View provides panoramic 360-degree views from designated roads throughout its coverage area. This video shows how you can use the Street View service to give your users a real-world experience of an address on the map, providing them with meaningful context about their destination or any place they're interested in. The coverage available through the Google Maps Android API v2 is the same as that for the Google Maps app on your Android device. You can read more about Street View and see the supported areas on an interactive map, at About Street View. The StreetViewPanorama class models the Street View panorama in your application. Within your UI, a panorama is represented by a StreetViewPanoramaFragment or StreetViewPanoramaView object. The Maps SDK for Android provides a Street View service for obtaining and manipulating the imagery used in Google Street View. Images are returned as panoramas. Each Street View panorama is an image, or set of images, that provides a full 360-degree view from a single location. Images conform to the equirectangular (Plate Carrée) projection, which contains 360 degrees of horizontal view (a full wrap-around) and 180 degrees of vertical view (from straight up to straight down). The resulting 360-degree panorama defines a projection on a sphere with the image wrapped to the two-dimensional surface of that sphere. StreetViewPanorama provides a viewer that renders the panorama as a sphere with a camera at its center. You can manipulate the StreetViewPanoramaCamera to control the zoom and the orientation (tilt and bearing) of the camera. Follow the getting-started guide to set up a Maps SDK for Android project. Then add a Street View panorama, as described below. The Google Play services SDK client library includes a few Street View samples which you can import into your project and use as a basis for development. See the introduction for guidelines on importing the samples. Follow the instructions below to add a Street View panorama to an Android fragment. That's the simplest way to add Street View to your application. Then read more about fragments, views, and customizing the panorama. Add a Fragment object to the Activity that will handle the Street View panorama. The easiest way to do this is to add a <fragment> element to the layout file for the Activity. Implement the OnStreetViewPanoramaReadyCallback interface and use the onStreetViewPanoramaReady(StreetViewPanorama) callback method to get a handle to the StreetViewPanorama object. Call getStreetViewPanoramaAsync() on the fragment to register the callback. Below is more detail about each step. Add a <fragment> element to the activity's layout file to define a Fragment object. In this element, set the class attribute to com.google.android.gms.maps.StreetViewPanoramaFragment (or SupportStreetViewPanoramaFragment). Get a handle to the fragment by calling FragmentManager.findFragmentById(), passing it the resource ID of your <fragment> element. Notice that the resource ID R.id.streetviewpanorama is added automatically to the Android project when you build the layout file. Then use getStreetViewPanoramaAsync() to set the callback on the fragment. Note: getStreetViewPanoramaAsync() must be called from the main thread, and the callback will be executed in the main thread. If Google Play services is not installed on the user's device, the callback will not be triggered until the user installs Play services. Use the onStreetViewPanoramaReady(StreetViewPanorama) callback method to to retrieve a non-null instance of StreetViewPanorama, ready to be used. Unlike with a map, it's not possible to configure the initial state of the Street View panorama via XML. However, you can configure the panorama programmatically by passing in a StreetViewPanoramaOptions object containing your specified options. If you are using a StreetViewPanoramaFragment, use the StreetViewPanoramaFragment.newInstance(StreetViewPanoramaOptions options) static factory method to construct the fragment and pass in your custom configured options. If you are using a StreetViewPanoramaView, use the StreetViewPanoramaView(Context, StreetViewPanoramaOptions) constructor and pass in your custom configured options. StreetViewPanoramaFragment is a subclass of the Android Fragment class, and allows you to place a Street View panorama in an Android fragment. StreetViewPanoramaFragment objects act as containers for the panorama, and provide access to the StreetViewPanorama object. Note: The Maps SDK for Android requires API level 12 or higher for the support of StreetViewPanoramaFragment objects. If you are targeting an application earlier than API level 12, you can access the same functionality through the SupportStreetViewPanoramaFragment class. You will also need to include the Android Support Library. Note: The Maps SDK for Android does not support multiple StreetViewPanoramaFragment objects in one activity. 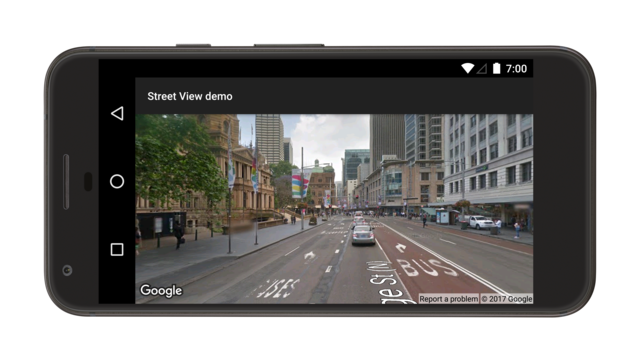 StreetViewPanoramaView, a subclass of the Android View class, allows you to place a Street View panorama in an Android View. A View represents a rectangular region of the screen, and is a fundamental building block for Android applications and widgets. Much like a StreetViewPanoramaFragment, the StreetViewPanoramaView acts as a container for the panorama, exposing core functionality through the StreetViewPanorama object. Users of this class must forward all the activity life cycle methods (such as onCreate(), onDestroy(), onResume(), and onPause()) to the corresponding methods in the StreetViewPanoramaView class. Note: The Maps SDK for Android does not support multiple StreetViewPanoramaView objects in one activity. By default, the following functionality is available to the user when viewing the Street View panorama: panning, zooming, and traveling to adjacent panoramas. You can enable and disable user-controlled gestures through methods on StreetViewPanorama. Programmatic changes are still possible when the gesture is disabled. Determines whether the user will be able to re-orient the camera by dragging. Determines whether the user will be able to move to a different panorama. Users can use a single tap on navigation links, or double tap the view, to move to a new panorama. Determines whether the user will be able to pinch to zoom. Determines whether the user is able to see street names displayed on the ground. To set the location of the Street View panorama, call StreetViewPanorama.setPosition(), passing a LatLng. You can also pass radius and source as optional parameters. A radius is useful if you want to widen or narrow the area in which Street View will look for a matching panorama. A radius of 0 means that the panorama must be linked to exactly the specified LatLng. The default radius is 50 meters. If there is more than one panorama in the matching area, the API will return the best match. A source is useful if you want to restrict Street View to only look for panoramas which are outdoors. By default, Street View panoramas could be inside places such as museums, public buildings, cafes and businesses. Note that outdoor panoramas may not exist for the specified location. // Set position with LatLng only. // Set position with LatLng and radius. // Set position with LatLng and source. // Set position with LaLng, radius and source. Alternatively, you can set the location based upon a panorama ID by passing a panoId to StreetViewPanorama.setPosition(). To retrieve the panorama ID for adjacent panoramas, first use getLocation() to retrieve a StreetViewPanoramaLocation. This object contains the ID of the current panorama and an array of StreetViewPanoramaLink objects, each of which contains the ID of a panorama connected to the current one. You can change the zoom level programmatically by setting StreetViewPanoramaCamera.zoom. Setting the zoom to 1.0 will magnify the image by a factor of 2. The following snippet uses StreetViewPanoramaCamera.Builder() to construct a new camera with the tilt and bearing of the existing camera, while increasing the zoom by fifty percent. You can determine the Street View camera's orientation by setting the bearing and tilt on StreetViewPanoramaCamera. The direction in which the camera is pointing, specified in degrees clockwise from true north, around the camera locus. True north is 0, east is 90, south is 180, west is 270. The Y-axis tilt up or down. The range is -90 through 0 to 90, with -90 looking straight down, 0 centered on the horizon, and 90 looking straight up. The variance is measured from the camera's initial default pitch, which is often (but not always) flat horizontal. For example, an image taken on a hill will probably have a default pitch that is not horizontal. The following snippet uses StreetViewPanoramaCamera.Builder() to construct a new camera with the zoom and tilt of the existing camera, while changing the bearing by 30 degrees to the left. The following snippet tilts the camera upward by 30 degrees. To animate the camera movements, call StreetViewPanorama.animateTo(). The animation interpolates between the current camera attributes and the new camera attributes. If you want to jump directly to the camera without animation, you can set the duration to 0. // Keeping the zoom and tilt. Animate bearing by 60 degrees in 1000 milliseconds.